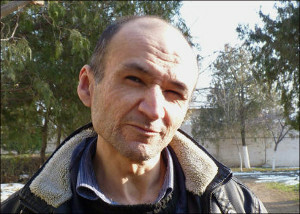 Independent journalist Jamshid Karimov has been forcibly and secretly contained in a psychiatric hospital in Samarkand since January 2012. At the orders of the ruling elite in Tashkent, the doctors there prevent any information on the journalist’s health from circulating; Jamshid Karimov is kept in complete isolation from the outer world and only rarely allowed to see his daughter. Jamshid Karimov is the son of Arslan Karimov, the elder brother of former President Islam Karimov. He was born in the city of Jizzakh and lived there since the early 2000s. As a journalist, he worked with international media, in particular with the Institute for War and Peace Reporting (IWPR), the news agency "Ferghana.Ru”, and the independent Uzbek website "Arena". He became known for his investigative reporting of the local authorities’ illegal activities and actively opposed censorship and authoritarianism on all levels. Since 2004, Jamshid Karimov was repeatedly attacked and beaten by unknown persons and harassed by local authorities. He believes the harassment was in retaliation for his journalistic activities and his criticism of the government. In mid-September 2006, Jamshid Karimov was placed under a compulsory treatment order in a psychiatric hospital for the first time. The decision was taken by the Jizzakh City Court, but was issued in secret without the participation of Jamshid Karimov, his lawyers or his family members who received no notification of the decision. After spending five years in the Samarkand psychiatric hospital, Jamshid Karimov was released in November 2011, presumably at the prompting of US Secretary of State Hillary Clinton during her visit to Uzbekistan. In early 2012, following orders from the authorities, Jamshid Karimov was again committed to the hospital. "He was hospitalized two months after being released”, said his 19-year-old daughter, Eugenia. “In the Samarkand psychiatric hospital he was kept in a room with barred windows, like a prison cell. Different people are sent there, even murderers sometimes. There was no trial at all. He was summoned to the National Security Service to have a "talk", but on his way there he was severely beaten by four men on the street. They knocked his tooth out, he was forced into a car and driven to the hospital. He was covered in bruises. He said that if he had been attacked by a single man, he would have been able to fight back, but there were four of them." According to Eugenia, a few months after her father was sent to the psychiatric hospital for the second time, his health deteriorated dramatically and he almost died. She cannot say exactly what happened to him, but she suggests that it was a reaction to the drugs they gave him or to what they added to his tea. "I was told that he [President Karimov) instructed the doctors to bring him back to normal," she says. "Police officers are stationed in his room all the time. If I go to visit him, they sit and listen to our conversations. One cannot say anything private because there are always people listening - sometimes one, sometimes two, sometimes three. They take my phone beforehand in order to stop me from photographing him. They have hidden from him the fact that the president is dead, perhaps because they believe that he will demand to be released. And the police prohibit anyone from telling him about it. He still hopes to be released. He says, ‘They won’t let me out before [Karimov’s] death’. And he often repeats that he will probably not live to see the day." Jamshid Karimov is now 49 years old and is clearly a victim of punitive psychiatry, a retaliatory measure not uncommon in Uzbekistan to suppress dissent among critical voices of the regime. During his short period of release, he reported that doctors had diagnosed him with "slow progressive schizophrenia", a diagnosis reminiscent of the Soviet practice of using psychiatry to justify the "insanity" of dissidents. It is obvious that he is no danger to society and should not be confined for such a long period to a closed ward in a hospital. Jamshid’s friends and colleagues are convinced that he is being held against his will and that the "treatments" he undergoes bear the all the hallmarks of punitive psychiatry.